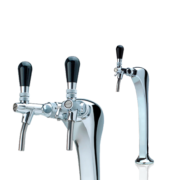 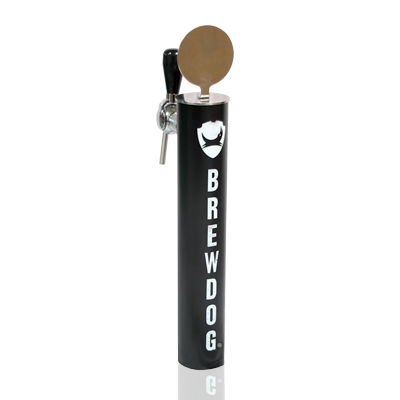 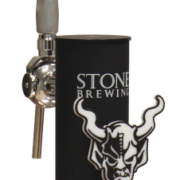 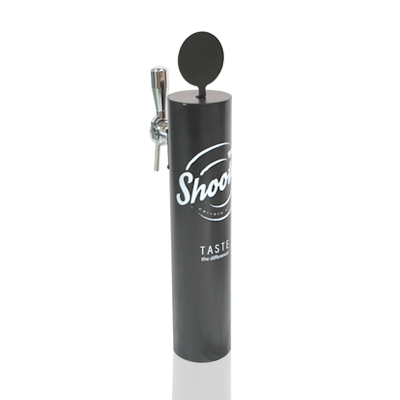 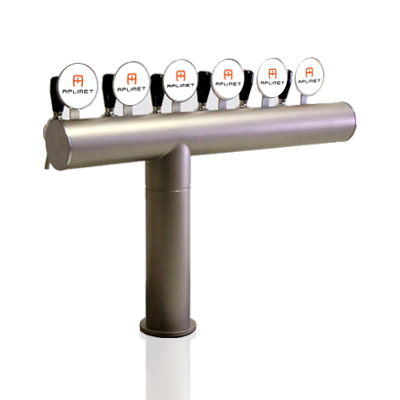 Beer dispensers, handles, towers, faucets and other accessories. 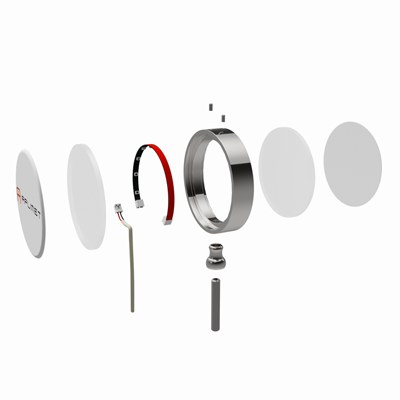 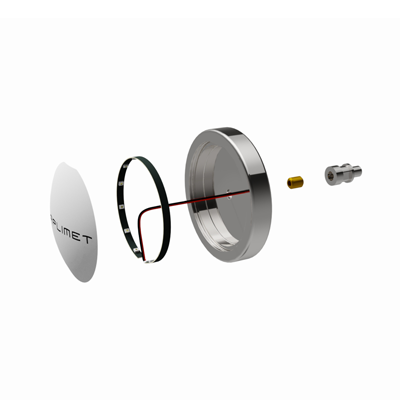 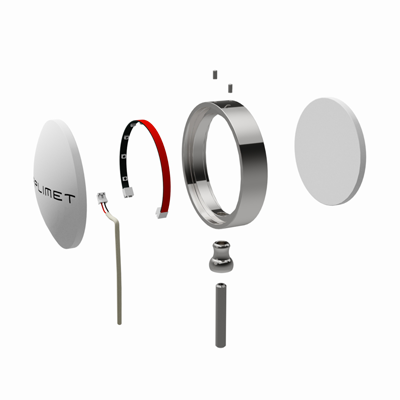 With the aim of facilitating the choice of products that best fit the needs of customers, on this page we present the complete Aplimet catalog. 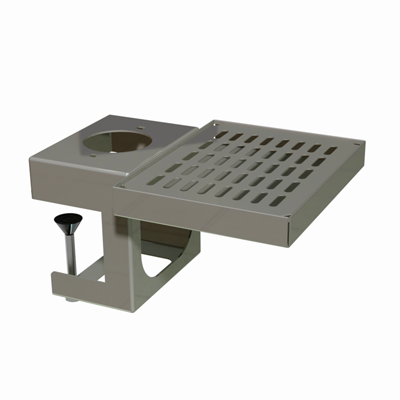 We put at your disposal about 100 products, which you can also find by category. 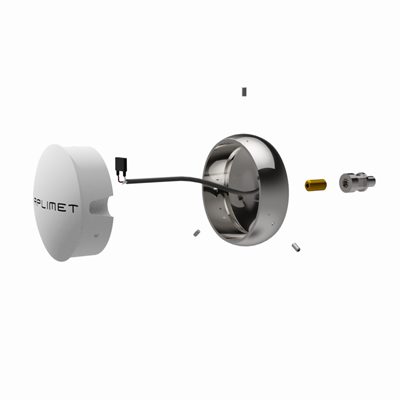 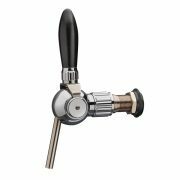 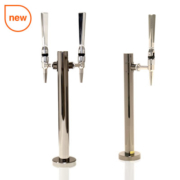 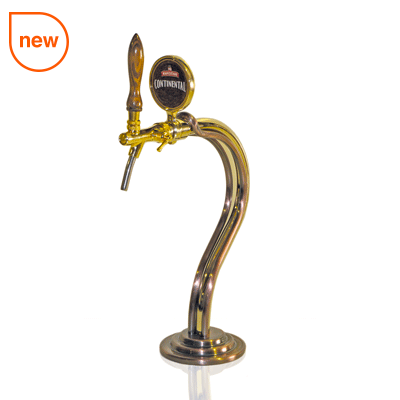 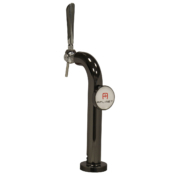 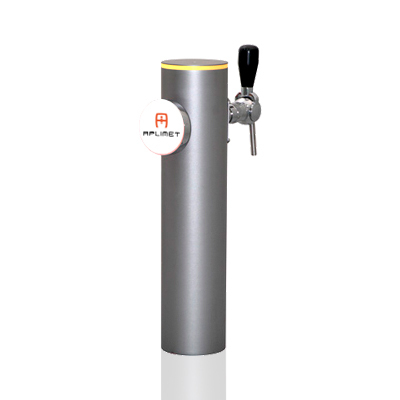 In addition, Aplimet offers advice in the selection and development of beer dispensers, handles, towers, faucets and other accessories, tailor made products with high quality designs incorporating the most advanced technology. 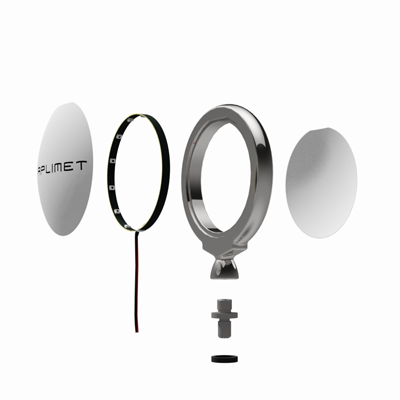 More than 100 products available. 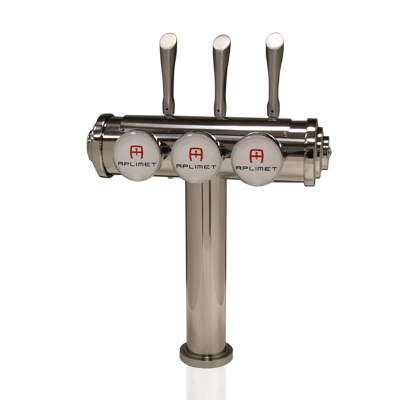 Aplimet offers advice on choosing beer dispensers, handles, towers, faucets and other accessories. 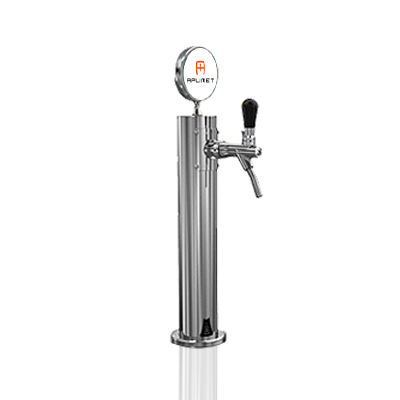 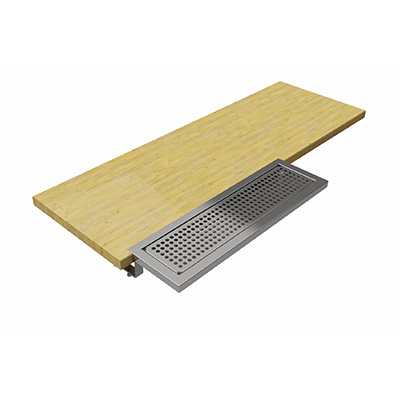 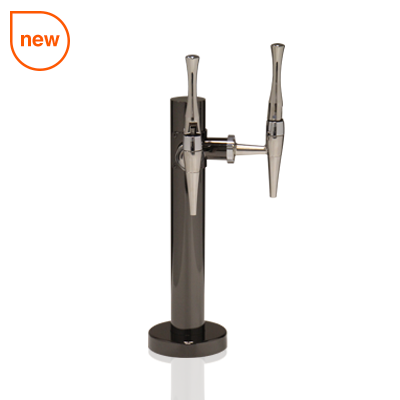 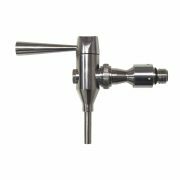 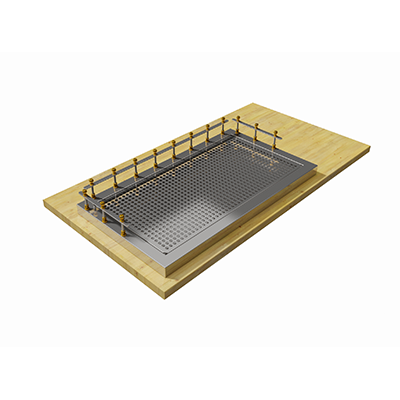 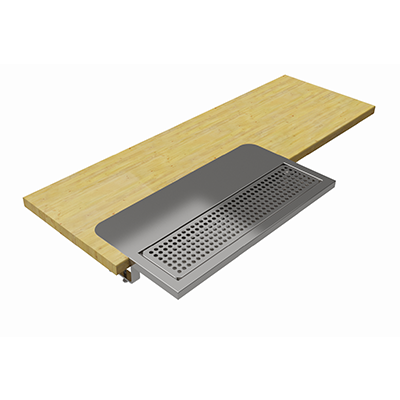 Stainless steel tap with large vertical opening includes compensator – flow regulator. 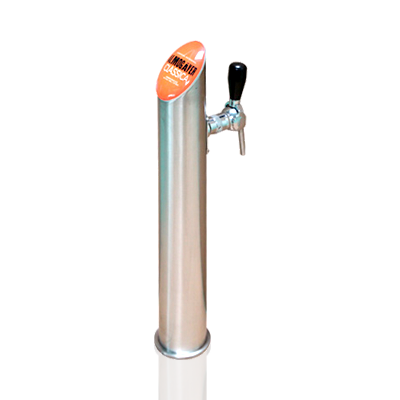 Following the undisputed success of our Filo beer tower, we designed a new version with more modern and simpler lines to give it more cachet. 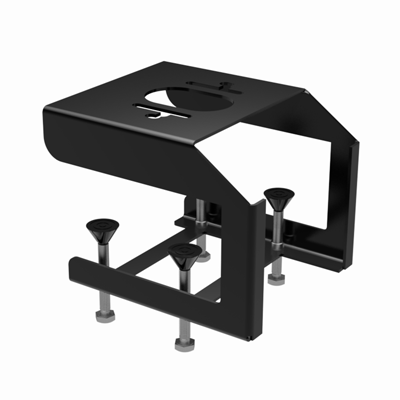 To meet the requirements of each client, we designed this model with a bigger and higher base offering a great variety of finishes. 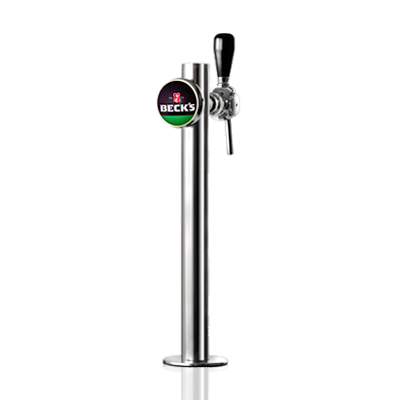 A wide range of possible finishes is also available, converting this beer tower into a “flexible” option to every brand, bar and counter. 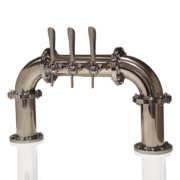 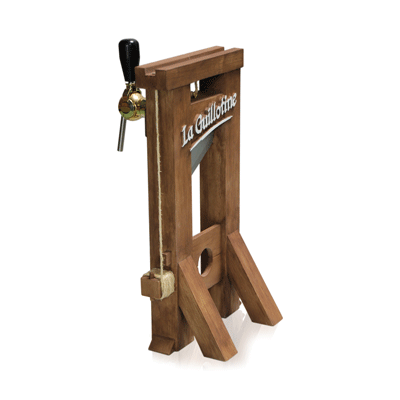 A favourite model selected by new craft breweries that are starting their first kegs. 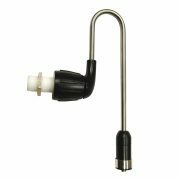 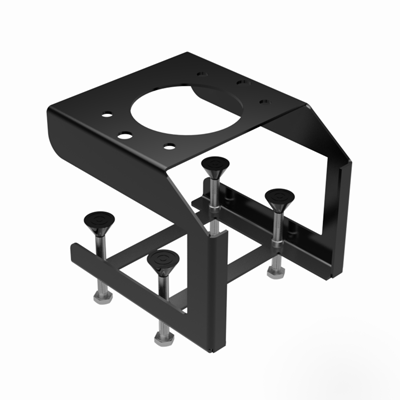 This simple tower, with a tubular design and made in stainless steel, is a very good option for tight budgets, as it allows changes and accessories. 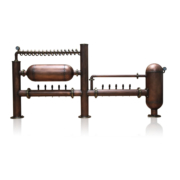 A variation of our traditional Millennium model. 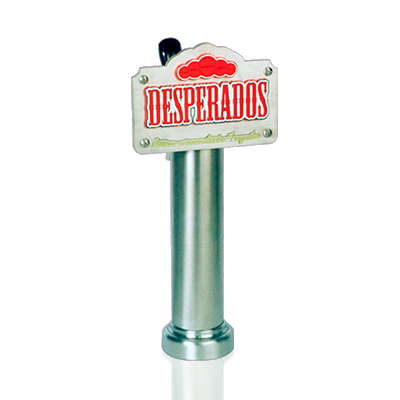 Logo integrated into the beer tower, giving a double visibility to the brand: from the interior of the bar and from the customer's perspective. 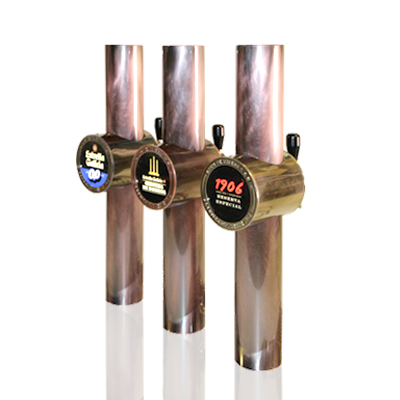 Marine-style beer tower representing the old sailors' lighthouses. 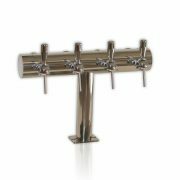 Made in polyurethane resin, it is available with multiple finishes, from metallised to aged finishes or from matt to bright varnishing. 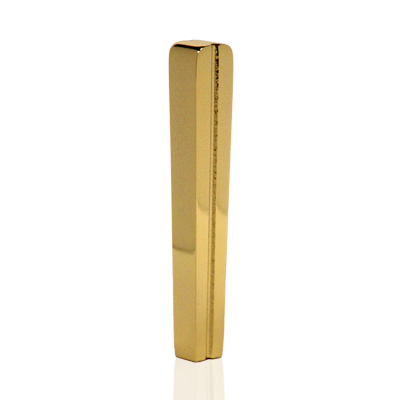 The metallised pieces made in polished brass gives it its special ¨touch¨. 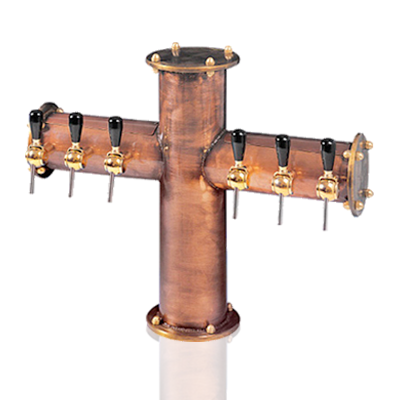 A more elaborate T-shaped beer tower. 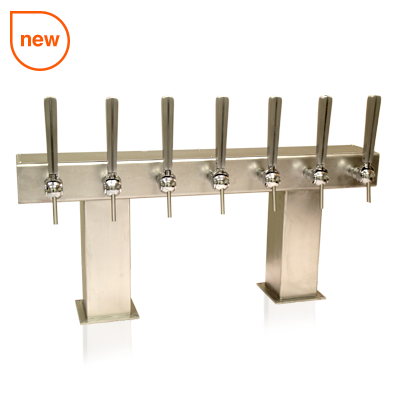 Made with stainless steel tubes, decorative side covers and an additional base, which give it an appearance of irreproachable quality. 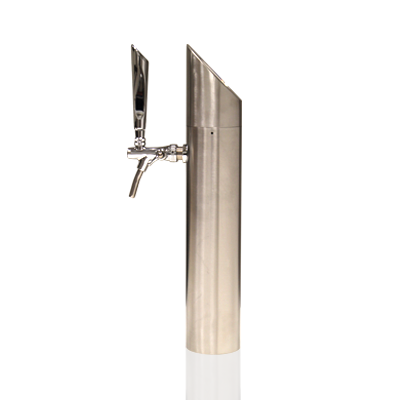 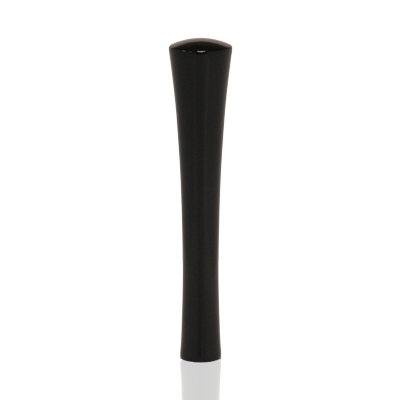 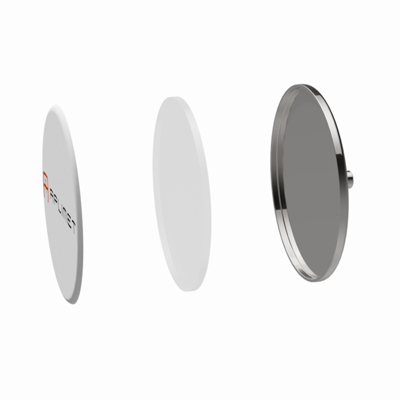 T-shaped model manufactured in stainless steel, with decorative side covers and with an additional base. 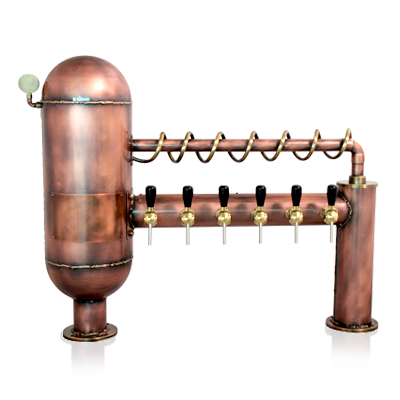 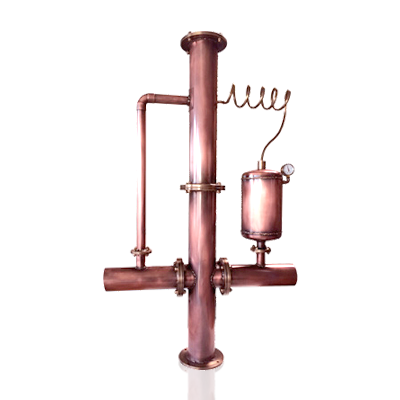 Simple, tubular beer tower that combines aged copper and brass, as in the former distilleries. 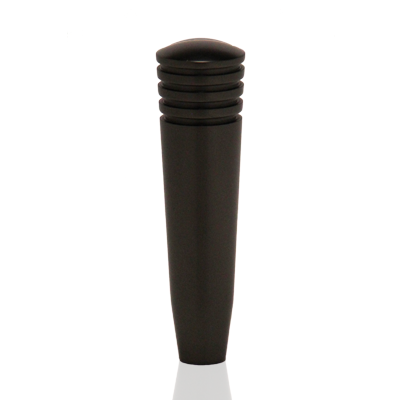 More complex, cross shaped with an extra accessory on its upper part, connected to an ornamental serpentine. 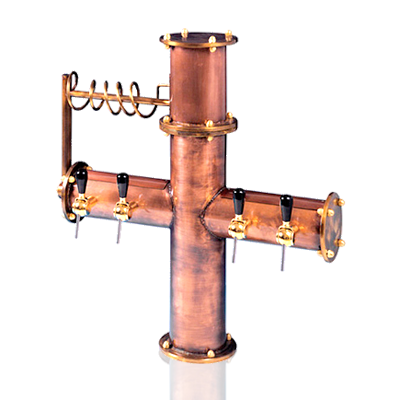 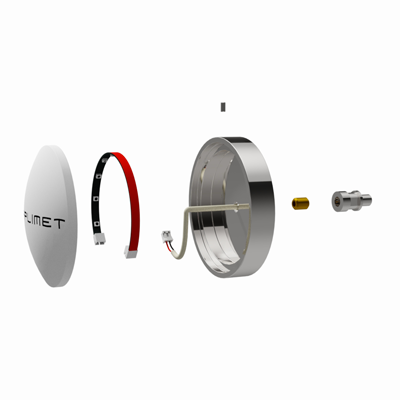 This model has a more complex cross-shaped pipeline network with a mini-container with a serpentine. 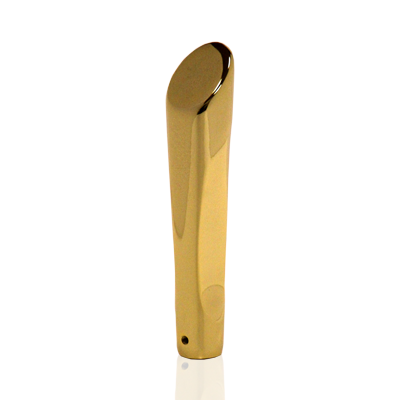 This modern and light tower design has been created for one of the most famous German brand in the world. 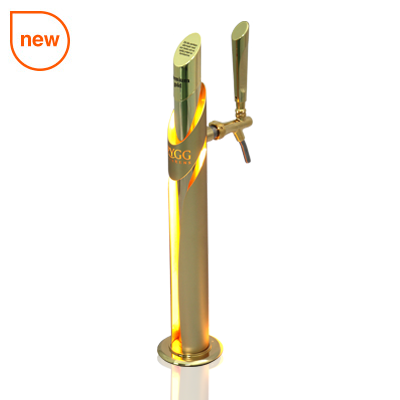 Its elegant and modern lines, the illuminated methacrylate engraved logo perfectly combines with the stainless steel impeccably ended. 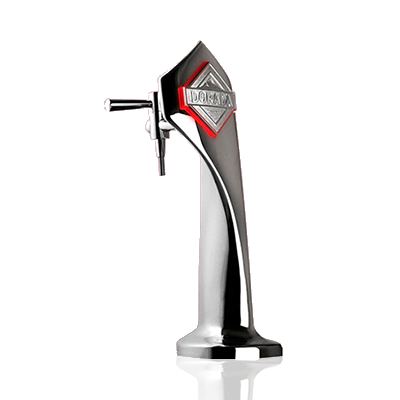 To customize this model we had to keep in mind that the brands of beer that it would take are deeply Irish so we represent some of the most typical icons of the island, its Celtic culture and a Gaelic style typography. 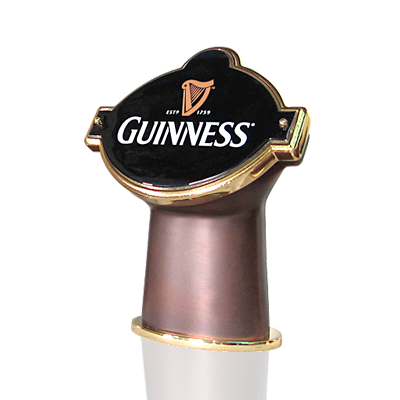 The result is a simple, luminous column full of symbols and "Irish identity". 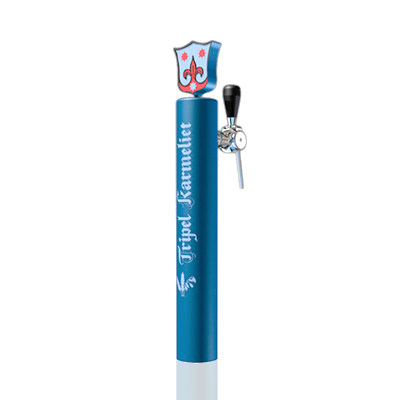 Another famous Belgian beer group requests us this peculiar beer tower, on which the logo of the brand is fully represented. 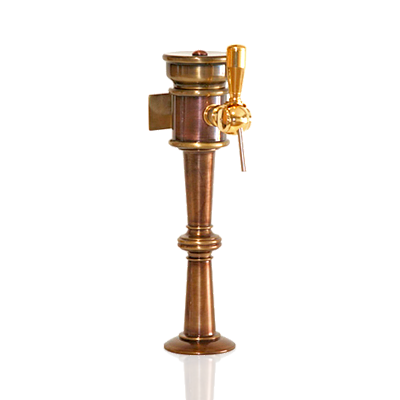 This “work of art”, specially designed by our sculptress up to the smallest details, is one of the most realistic towers of our portfolio. 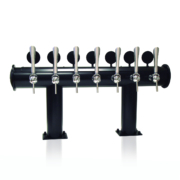 It would not miss a Trappist beer in our portfolio of personalized columns. 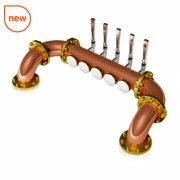 Bavaria España, great customer of the house, orders us this beer shooter for the Spanish market. 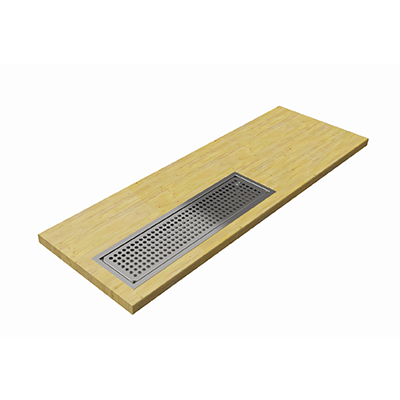 It is made of cast brass and features the grinding, polishing and oven-dried paint treatments to give maximum surface durability. 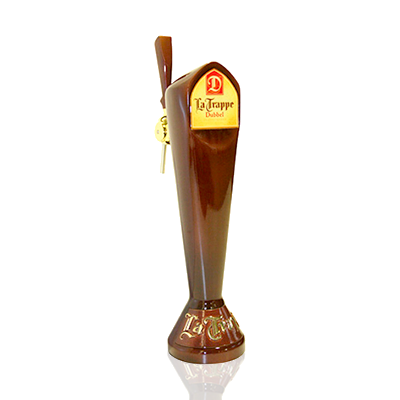 They emphasize the metallic letters of the base in relief and its logo in the form of a chapel in the upper part, elements that endow it with the Trappism character that this mark possesses. 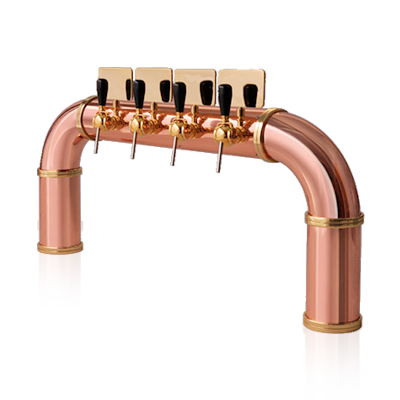 The brewer Les Braseurs du Gayant, located in the north of France, orders us a shooter for one of its most premium beers with a very special design: it is created in conjunction with the management of the factory. 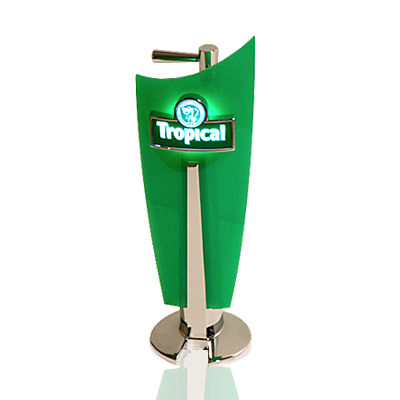 The result is this precious column made of polyurethane resin with a large illuminated upper oval, which houses a large methacrylate plate screened with its mark. 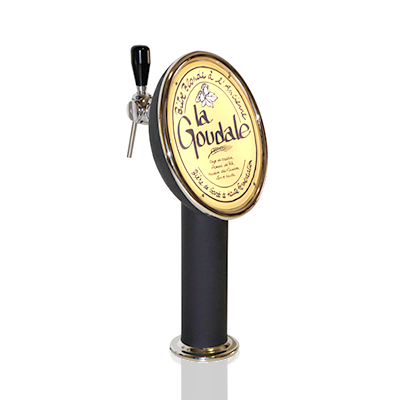 "La Goudale" and "Tripple secret des moines" are the two marks chosen to represent in this shooter. 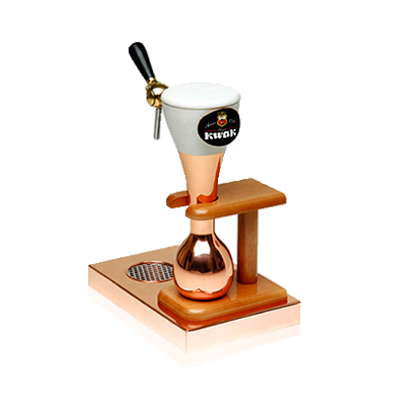 Brouwerij Bosteels, as is tradition in the history of our company, orders us its star marksman for its best known brand: Kwak beer. 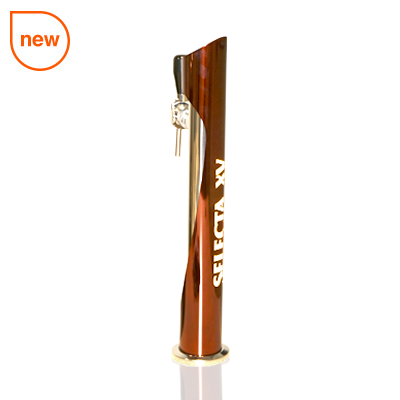 Designed with a carved wood base and its body imitating the corporate glass of the brand (made of polyurethane resin metallized in glossy copper and imitation cream paint) they give that unique personality that the brand needs. 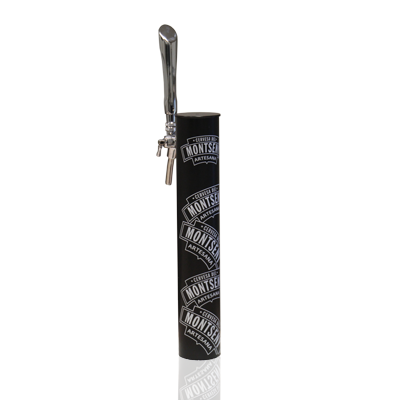 One of the most important beer brands could only deserve a shooter of this magnitude. 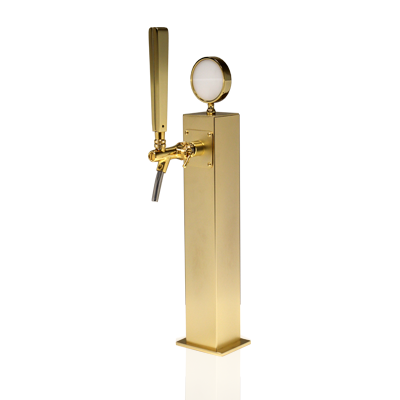 Another of our collaborations with the Brasserie Fisher was the personalization of the marksman of the mark KRISKA, a soft combination of beer and vodka. 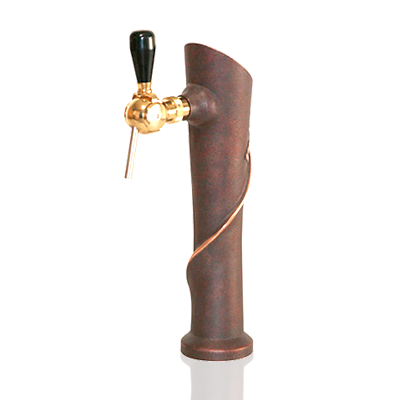 The column had to convey the image of the cold ice and had to be very original and modern, away from the traditional brewing lines. 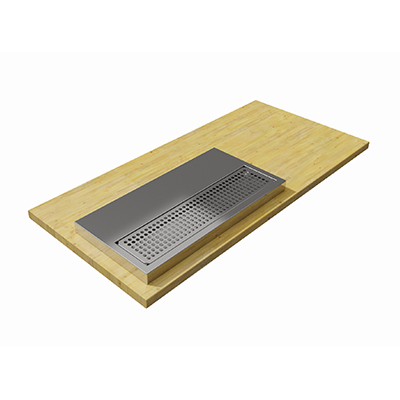 At the time it was the first models to incorporate light from the interior, without parts or supports for additional logos. 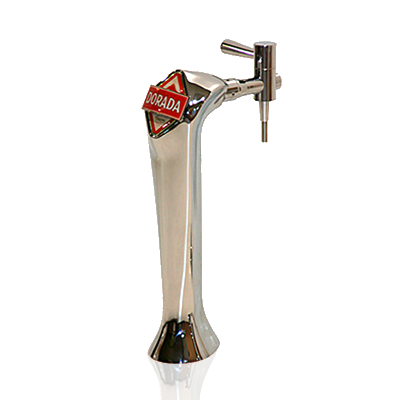 Following the same philosophy as its younger brother Palm (Tropical), the Brewery Company of the Canary Islands (CCC) also commissioned us to manufacture its standard column for its most popular beer. 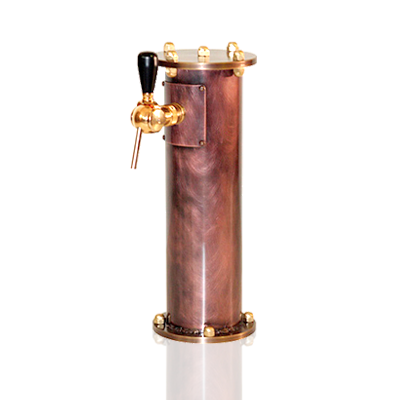 This column also incorporates the flood system to give that feeling of freshness that, in an environment where the heat reigns throughout the year, is so grateful. 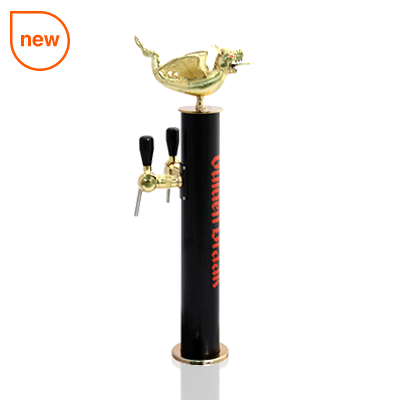 The Canary Brewery Company (CCC), a regular customer of our company, has been in charge of this shooter for many years, since it communicates the desired brand image. 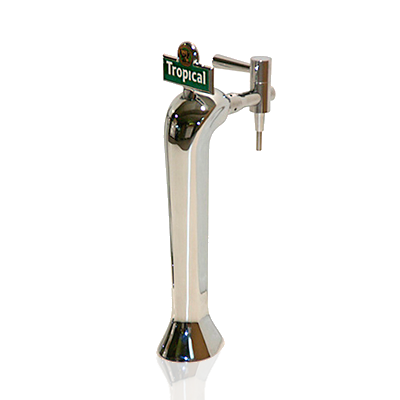 La Cerveza Tropical, the second brand in its portfolio, is served in a brass cast handle with corporate logo, which allows serving this fresh beer thanks to its built-in flood system. 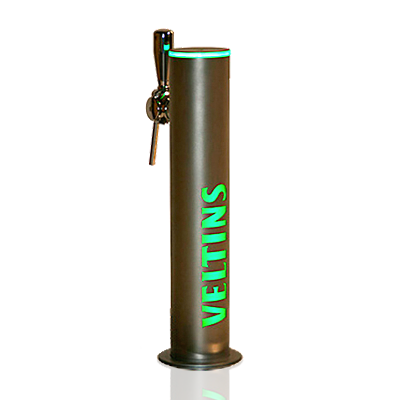 Veltins España bets again by Aplimet to manufacture the shooter that represents its new craft beer "Original GREVENSTEINER". 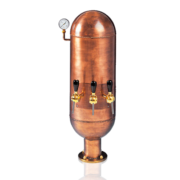 Being a brand inspired by the traditional elaboration and having chosen the model of historical bottle Steinie, we bet by a handmade reproduction of the same adapting it technically for its function of dispenser. 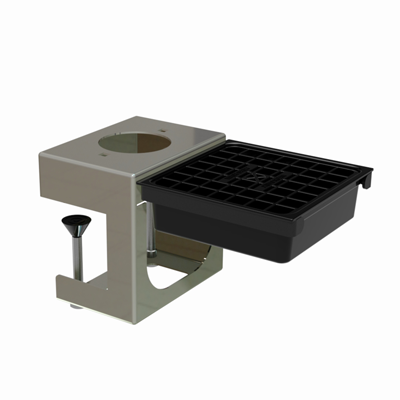 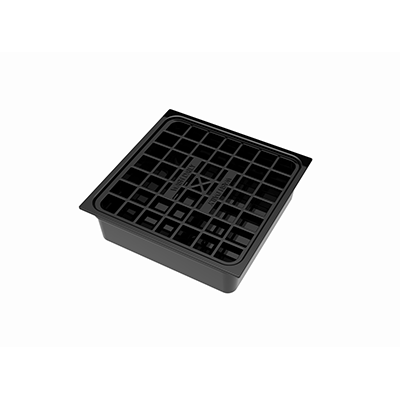 All processes are reproduced manually, from the injection of the polyurethane resin to the application of the silkscreen. 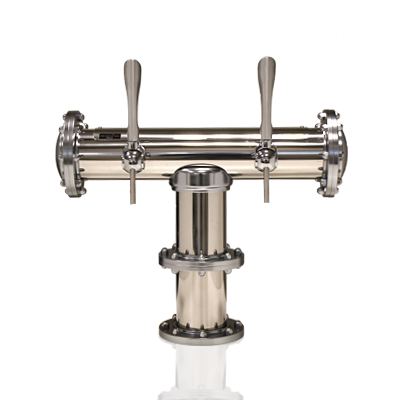 The handle is finished with the same closing cap of the original bottles. 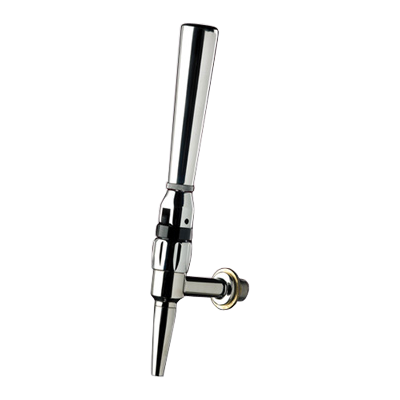 Brass tap with long vertical opening. 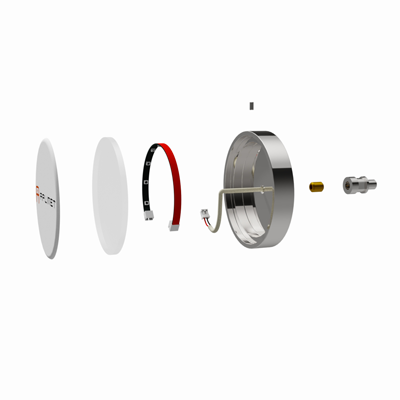 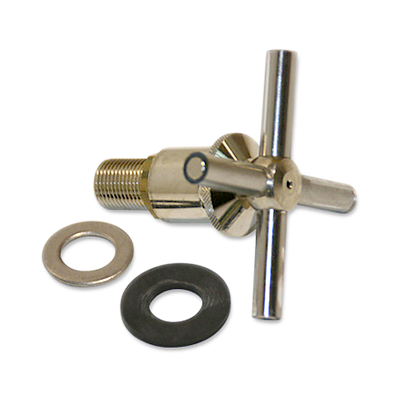 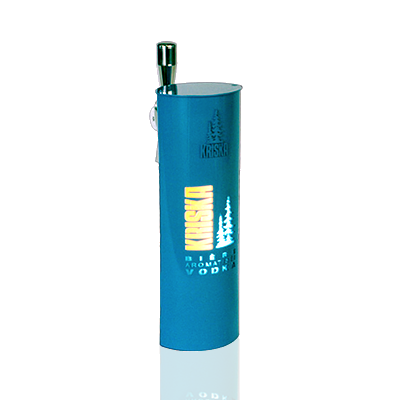 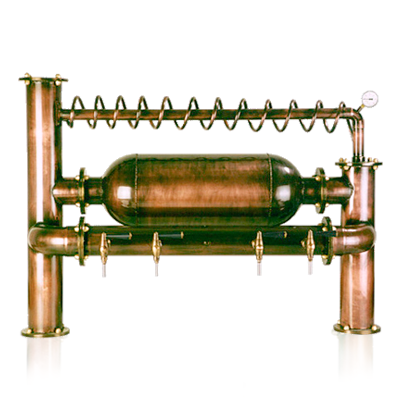 Includes a compensator – flow regulator/controller. 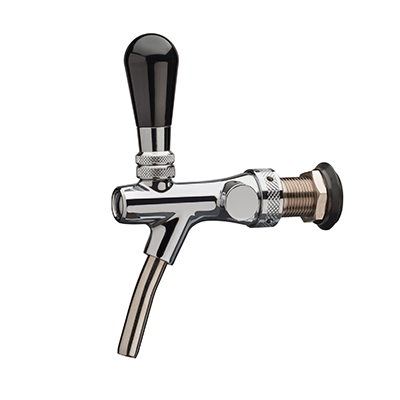 Finishes Polished chrome | Gold Taps Fauceet 5/8" | Faucet 1/2"
Traditional brass tap manufactured with short vertical opening. 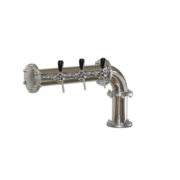 Includes a compensator- flow and reverse regulator to produce foam. 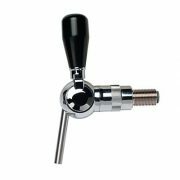 Finishes Polished chrome | Gold Taps Fauceet 5/8" | Faucet 1/2"
British style stainless steel tap available with vertical opening with reverse regulator to produce foam. 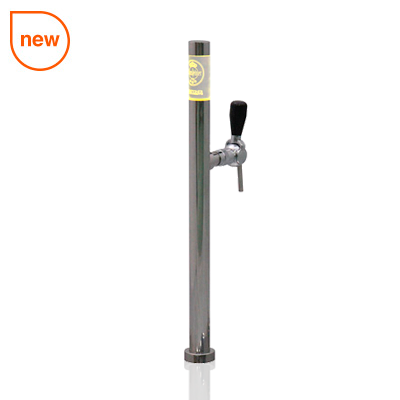 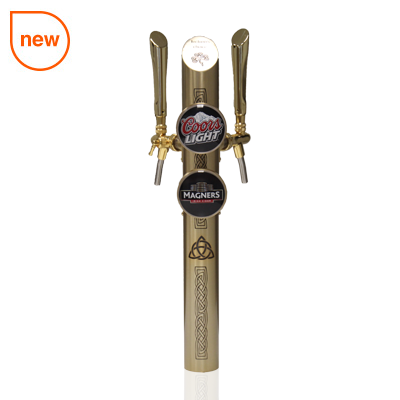 Also available with filter for stout or similar draught beers. 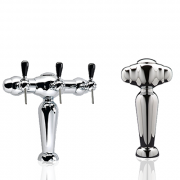 Finishes Polished chrome | Gold Taps Fauceet 5/8" | Faucet 1/2"
Spanish style stainless steel tap, available with horizontal opening. 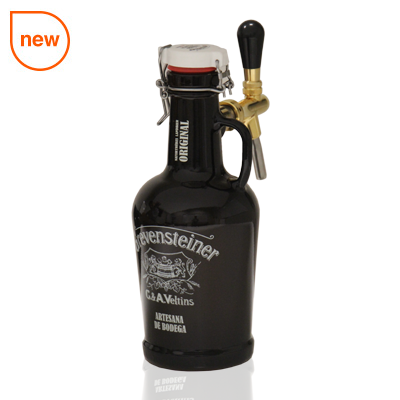 Includes a compensator to regulate the beer flow. 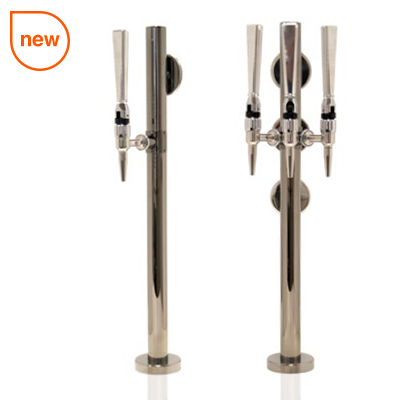 Finishes Polished chrome | Gold Taps Fauceet 5/8" | Faucet 1/2"
Iron support used to fix beer towers and standard drip trays of our catalogue onto the bar. 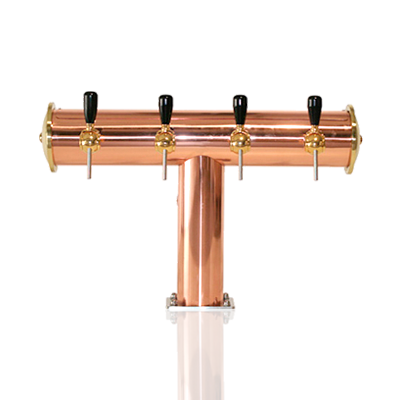 Finishes Painting - black Bar fixing Located under the stainless steel drip tray to fix the beer tower and drip tray to the bar. 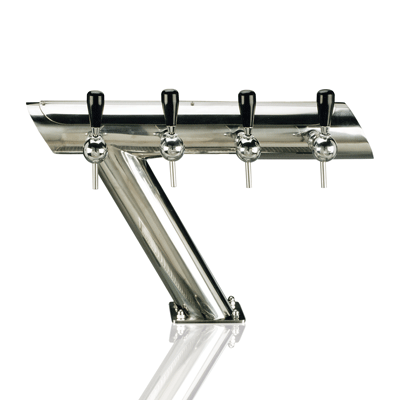 Iron clamp-on used to fix beer towers and standard drip trays onto the bar. 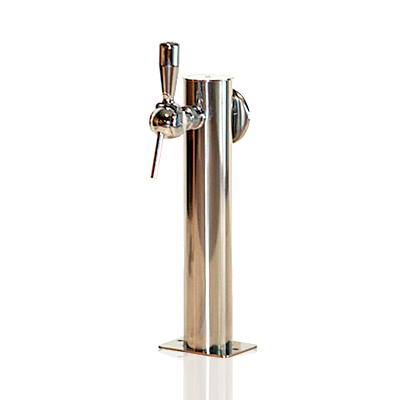 Finishes Painting - black/grey Bar fixing Located under the stainless steel drip tray to fix the beer tower and drip tray to the bar.